Lava lakes are no longer present at Ambrym volcano since December 2018. Ambrym Island is the Jewel of the Pacific. 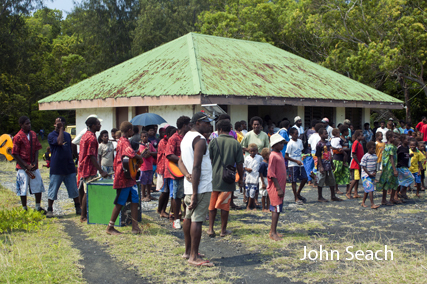 The island is located in central Vanuatu, South West Pacific. 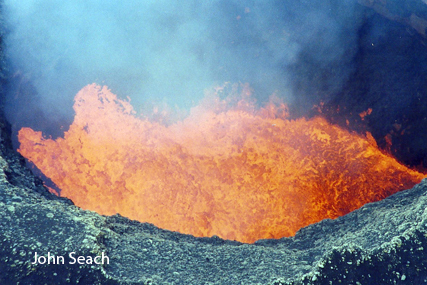 Explorers to the region in the 1800's were impressed by the majestic islands and dramatic eruptions from Ambrym volcano. Ambrym Island contains one volcano with five craters. Lava lakes regularly appear in Benbow and Mbwelesu craters. Marum crater is not active and has not erupted for more than 60 years. The lava lake often attributed to Marum crater is actually in a side crater called Mbwelesu. 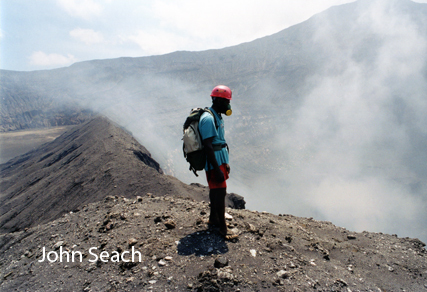 French explorers were the first to descend into the craters at Marum, Mbwelesu, and Benbow in the 1990's. 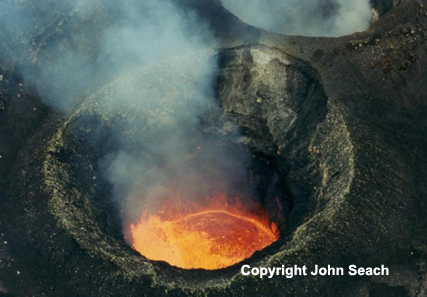 An expedition by French volcanologists descending into the active craters was filmed for National Geographic in 1999. 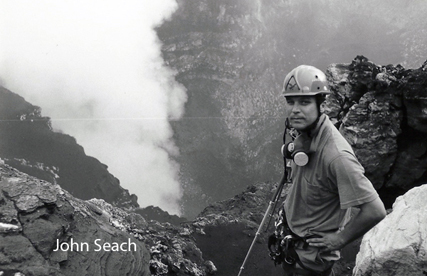 John Seach inside Benbow lava lake crater - no ropes! 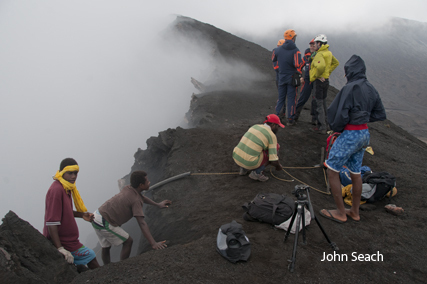 at Ambrym volcano in 2009. The jungle on Ambrym Island is impressive with tree ferns growing to 10 m high. Beautiful pink orchids thrive in the acid environment close to the craters edge. Ambrym Island is triangular in shape, approximately 50 km in diameter. Villages are located on the coast in three regions. Each region is separated by jungle without roads. Motorised canoes travel between west and north Ambrym. The summit of Ambrym Island contains a desert-like caldera covering an area of 100 sq km. Some walking routes between coastal regions on the island pass over the volcanic caldera. Lower slopes of the volcano contains dense jungle right down to the sea. 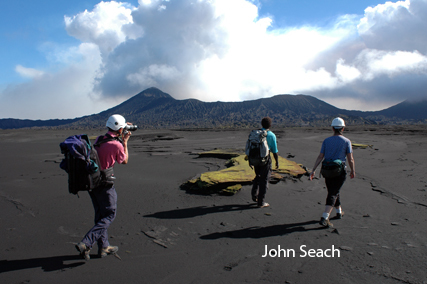 John Seach has been leading tours to Ambrym Island since 1998, and has been to the craters at Ambrym volcano on more than 180 times. 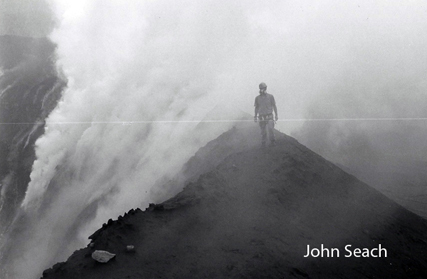 John specialises in free climbing into the craters at Ambrym volcano. 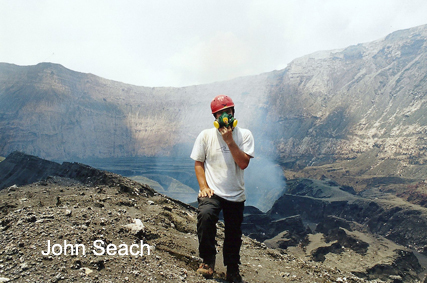 John Seach provides professional services to the film and television industry with many years volcano filming experience worldwide.